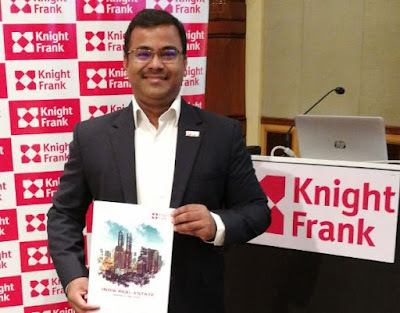 Knight Frank India has announced the tenth edition of its flagship half-yearly report – India Real Estate. The report presents a comprehensive analysis of the residential (across eight cities) and office (across seven cities) market performance for the period July – December 2018 (H2 2017). The report has established 2018 to be historically best performing year for the commercial office with leasing crossing 46 million square feet (msf). For the residential market saw some upward movement in sales velocity but stopped short of being a year of recovery. Total sales of residential units were estimated to be 242,328 units registering a 6% increase over full year 2017. Both the residential and the commercial office markets of Bengaluru saw an uptick in demand. For the residential market, sales for full year 2018 were registered at 43,776 units, while new units launched were registered at 27,382 units. Commercial office demand remained strong for another year, with leasing activity levels settling at 13.4 msf, while supply largely remained restricted at 7.6 msf in 2018. On an overall basis, 2018 saw new residential unit launches to the tune of 27,382 units marking a 22% rise y-o-y, albeit on a smaller base. For the first time since 2014, the residential market saw positive sales growth putting the residential sector on an upward growth trajectory. The average residential prices in 2018 saw a marginal growth of 2% y-o-y over 2017, but with smaller units, the effect on ticket sizes was limited. Bengaluru continued to see the highest volume of leasing with over 13 msf being transacted in the entire year. The percentage growth in 2018 over last year was recorded at close to 15%. H2 2018 recorded nearly 7 msf of office space leasing surpassing the transaction volume in the first half of 2018 and registering a y-o-y growth of close to 17% from same time last year. BFSI sector led the leasing activities in the city constituting 28% of total leasing volumes in H2 2018, while IT/ ITeS took up 37% share of total leasing volume. At 7.6 msf, the total supply in 2018 took a contrarian path and registered a y-o-y decline of 6% over 2017. As a result of office space demand continually outpacing supply, the vacancy levels in Bengaluru have been registered at 4.3%. In the same space, the average rental values for Bengaluru also saw a rise of about 17% in 2018.